Possibilities of the debt crisis worsening increased with no fruitful result even after the recent summit of European leaders and stock markets in Europe and Wall Street experiencing a sharp decline in trading. In order to prevent the debt crisis in Europe from spreading further, politicians Europe are leaning towards a tight economic control of all the countries in the Euro Zone and believe that establishing an overall fiscal consolidation might hold the key to address the issue. Experts at the Forex ECN company InvestTechFX report that as the ECB (European Central bank) has already reduced the interest rates in the Euro Zone to an all time low of 1 per cent (a reduction of 0.25 per cent), the bank has decided that they would not intervene in bond markets aggressively. Director of investments at Capital Economics, John Higgs stated that, ?With the European Central Bank making its decision of not to intervene, the chances of fragmentation and dissolution of the Euro Zone have greatly increased.? The British government not consenting to strengthening the ties between the Euro Zone countries has lead to more financial disappointments in stock markets across the globe despite the numerous recommendations and proposals formulated by the leaders of Europe. The Forex trading company InvestTechFX is a proven leader in the industry of artificial intelligence software. They are renowned for their top notch trading technology systems in the computerized trading industry and their experts develop advanced, customizable, intuitive, efficient, and sophisticated trading tools that help people understand Forex currency exchange trading related trends and developments. The FX trading company recently announced a new limited time ?Dollar for Dollar? 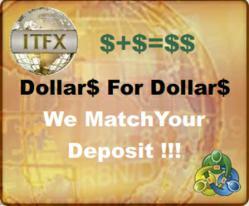 promotional offer where ITFX matches the customer?s deposit.